Background: CNE President Miguel A. Soto-Class and BRAF President John Davies. Returning to the status quo that existed prior to Hurricane María will not be enough for Puerto Rico: the island must seek to leapfrog into a renewed development platform, generating a profound retooling and modernization of its productive and institutional infrastructure. This was the conclusion drawn by the Center for a New Economy (CNE) and a renowned post-disaster reconstruction expert that has partnered with the San Juan based think-tank and its Puerto Rico Recovery Fund, the relief and reconstruction effort created to address the devastation caused by Hurricane María in Puerto Rico. “The rules of the game have changed,” said CNE President Miguel A. Soto-Class. “This is why in CNE we quickly mobilized our resources, capabilities and networks after the hurricane in order to create a fund that could provide not only humanitarian relief to those affected, but that could also serve as a short, mid and long term platform to drive advocacy efforts on behalf of the island in Washington D.C. and to rethink the economic reconstruction of Puerto Rico emphasizing the concept of resiliency,” he said. “Resiliency, in broad terms, refers to the capacity of a society to recover quickly from a devastating event,” he said. Soto-Class warned nonetheless, that Puerto Rico will need to go beyond the goal of becoming a resilient society. “The magnitude of the devastation and the depth of the economic shock caused by María makes it urgent for the island to articulate a comprehensive reconstruction process. Puerto Rico has the enormous challenge of propelling a truly qualitative leap, that is, to create a renewed development platform that can generate new productive capabilities and that can create social and economic opportunities that did not exist prior to María,” Soto-Class said. One of the first entities to support CNE’s effort on behalf of Puerto Rico was the Baton Rouge Area Foundation in Louisiana (BRAF). BRAF was fundamental in articulating a response and relief effort for the victims of Hurricane Katrina and the recovery efforts in the southern region of the state. 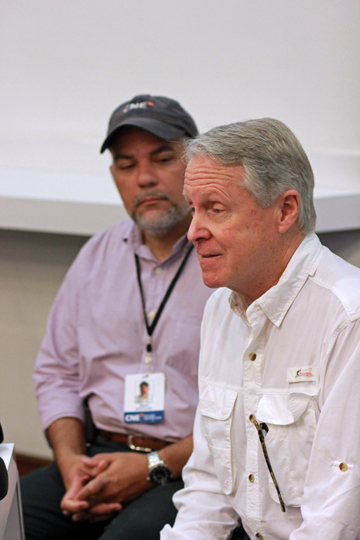 BRAF President John Davies said Puerto Rico must be prepared to deal with the human effects of the hurricane’s devastation for a long time to come. “Our experience with Katrina and other big disasters shows that people get busy putting their lives together after storms; they are not focused on themselves,” Davies said. “More than 40 percent of them start feeling sad and anxious in a month or two after a storm, and many of them don’t slip into sadness and anxiety until the storm’s anniversary. We must be prepared to take care of those who need it, not only now but for many years to come,” Davies said. The Baton Rouge Area Foundation responded to Hurricane Katrina by raising $45 million around the world and creating a two-pronged investment strategy in South Louisiana. First, it provided resources to nonprofits that supplied food, shelter and necessities to those displaced by the hurricane. Second, it funded critical infrastructure and long-term planning projects focused on rebuilding stronger and smarter in order to withstand future large-scale atmospheric phenomena. In its first phase, CNE’s Puerto Rico Recovery Fund has mobilized in four weeks 23 humanitarian flights into the island and has distributed more than 900,000 pounds of food, water and necessities in 234 communities in 44 municipalities affected by the hurricane. The effort has gathered 29 local NGOs and four local businesses, as well as nine commercial and nonprofit U.S.-based entities. CNE’s Fund will also spearhead advocacy efforts in San Juan and Washington D.C. to ensure maximum federal support for the island’s reconstruction and efficient resource coordination. The Fund will also develop mid and long term economic planning initiatives through CNE’s Growth Commission for Puerto Rico. Hey Buddy!, I found this information for you: "CNE: PR must ‘leapfrog’ into renewed, resilient island". Here is the website link: https://newsismybusiness.com/leapfrog-renewed-resilient/. Thank you.